It was another successful weekend for Dudley’s Reanne Evans who completed the successful defence of three titles at the 2019 Festival of Women’s Snooker to ensure that she would return to the top of the World Women’s Snooker ranking list. 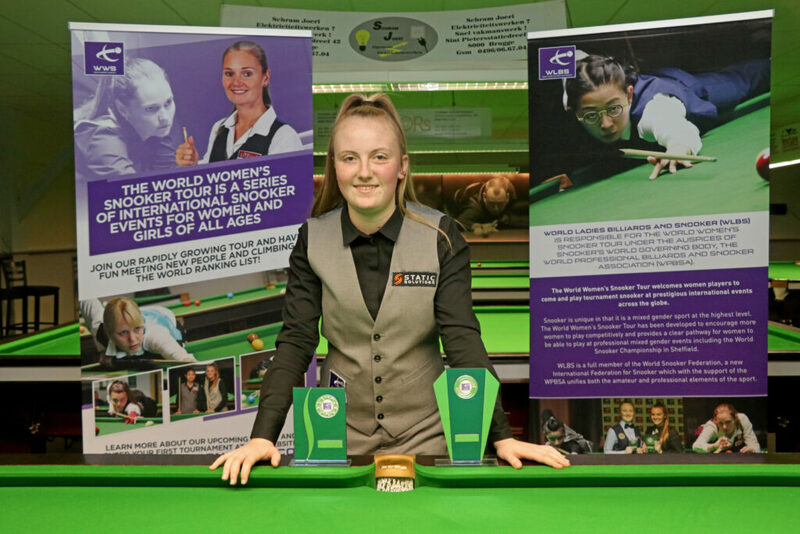 Held at the Northern Snooker Centre in Leeds, England, the Festival saw a record field of entries from across the globe come together for the four-day event which saw five world championship titles decided. Coming into the event on the back of three ranking titles already this term, Evans first claimed success in the World Women’s 10-Red Championship event as she dispatched Louise Cothier, Steph Daughtery, Emma Parker and Chinese debutant Chunxia Shi to reach the final, before coming back from 2-0 down to defeat Ng On Yee 4-3 in the final. The result meant that Evans headed into Sunday’s 6-Red competition knowing that a quarter-final run would be sufficient to guarantee her return to the top of the ranking list at the expense of her long-time rival. Quick-fire wins against Hong Kong pair Yeeting Cheung and So Man Yan ensured that this would be the case before she added the scalps of Steph Daughtery, Baipat Siripaporn and finally Nutcharut Wongharuthai (who has defeated On Yee in the semi-finals), to seal a title double in the singles competitions. This became a triple the following day as together with five-time world championship finalist Maria Catalano, Evans defeated Thai duo Ploychompoo Laokiatphong and Baipat Siripaporn to win the World Women’s Pairs Championship title for a third time on Monday. The win did not come easily however as the pair came through deciding-frame finishes in two matches on their way to the final, first against Ng On Yee and So Man Yan in the last eight, before coming through against Thai pair Wongharuthai and Waratthanun Sukritthanes in the semi-finals. The World Women’s Under-21 Championship saw a new winner as 16-year-old Ploychompoo Laokiatphong upset fellow Thai player and defending champion Nutcharut Wongharuthai in the final. With the pair having topped their round-robin groups to set up the final meeting it was ‘Ploy’ who moved into a 2-1 lead before she sealed an impressive victory with a break of 70 in what proved to be the final frame. 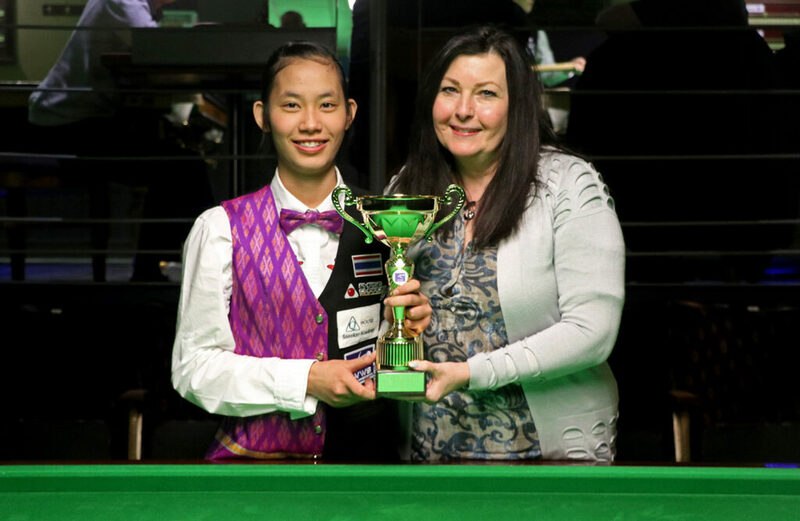 Ploy would also secure the Challenge Cup title during the 6-Red competition to complete a fantastic weekend for the youngster, while Emma Parker secured the under-21 Challenge match against Baipat Siripaporn. 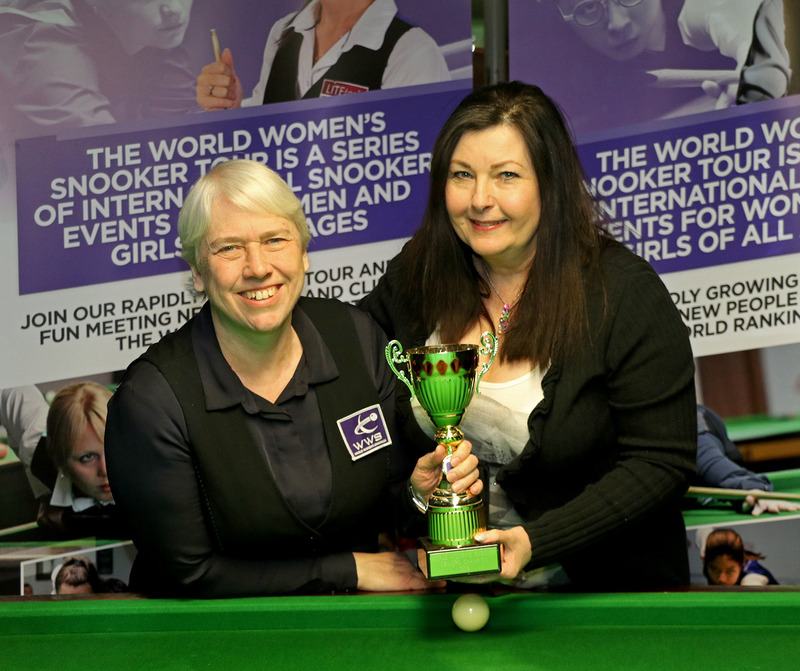 This year’s World Women’s Seniors Championship saw Jenny Poulter complete the successful defence of her title with a 2-0 victory against the returning Jan Hughes on Saturday afternoon. 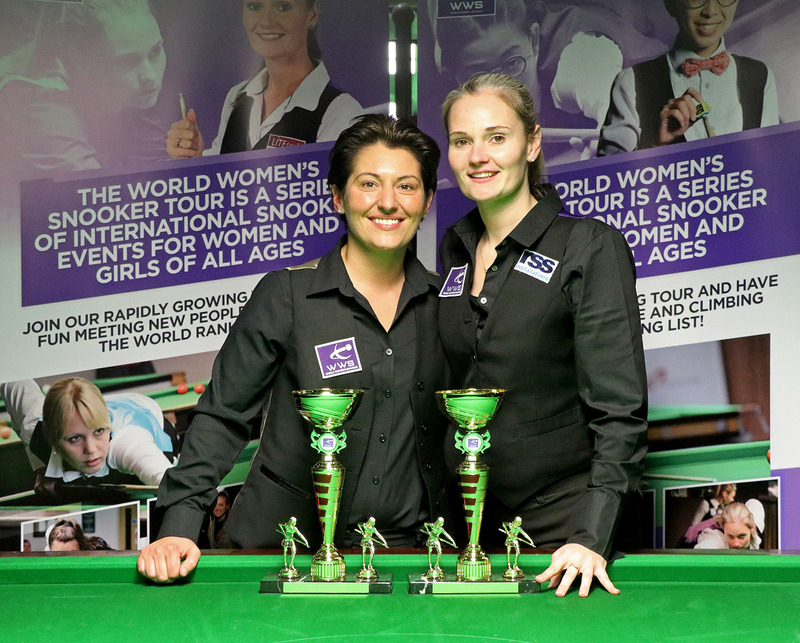 Following a competitive round-robin stage which saw a 100% increase on entries compared to a year ago, it was the pair who won their respective groups to progress to the final, which saw Poulter edge both frames to claim the title once again. 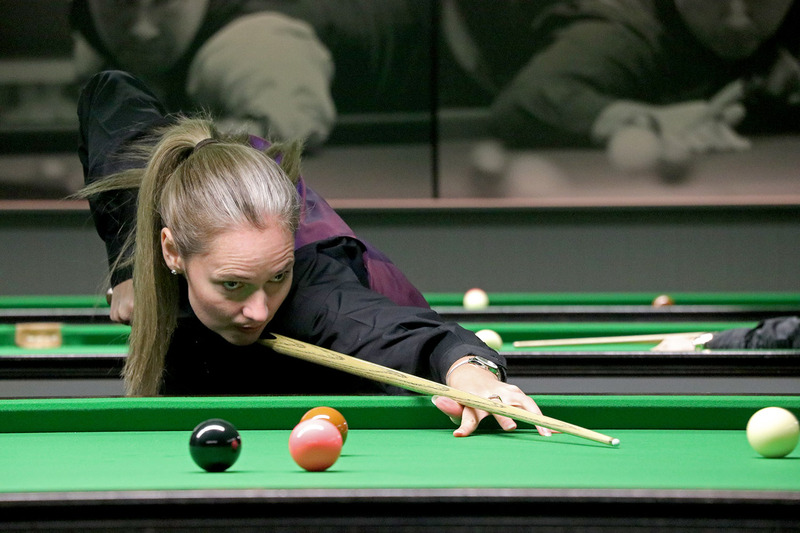 The Challenge Cup event was won by Jane O’Neill representing Spain following a 2-0 success against Maureen Rowland. 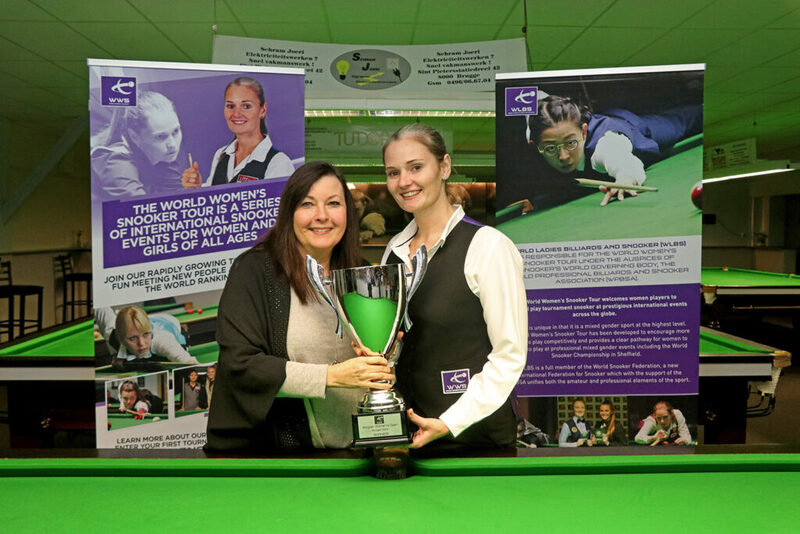 There was also success for Laura Evans of Wales who edged out pairs partner Suzie Opacic to claim the Challenge Cup title in Saturday’s 10-Red tournament. The highest break during the weekend was a magnificent total clearance of 130 made by Ng On Yee during Monday’s pairs competition, after she had also made a 71 clearance against Romania’s Corina Maracine during the 6-Red event, just four short of the maximum 75 points available under the format. 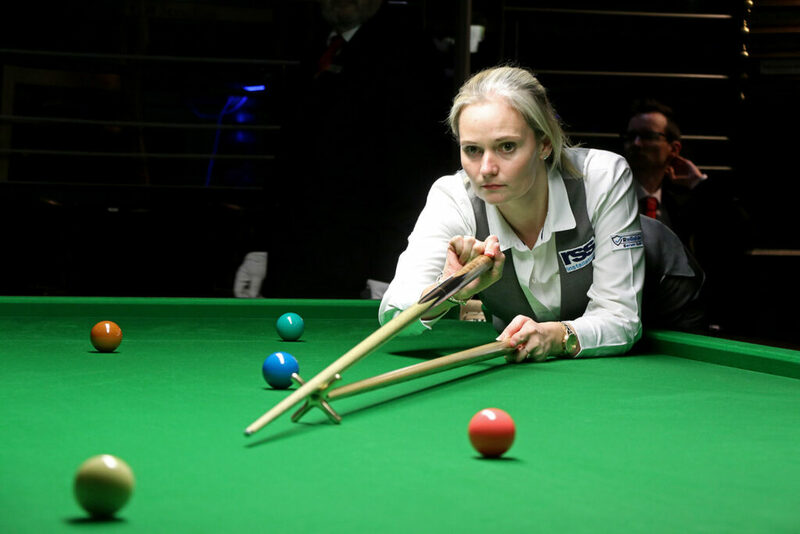 For the first time followers from home could follow the action using the new WPBSA Tournament Manager, which provided live scores from up to three tables with regular updates from the remaining matches. 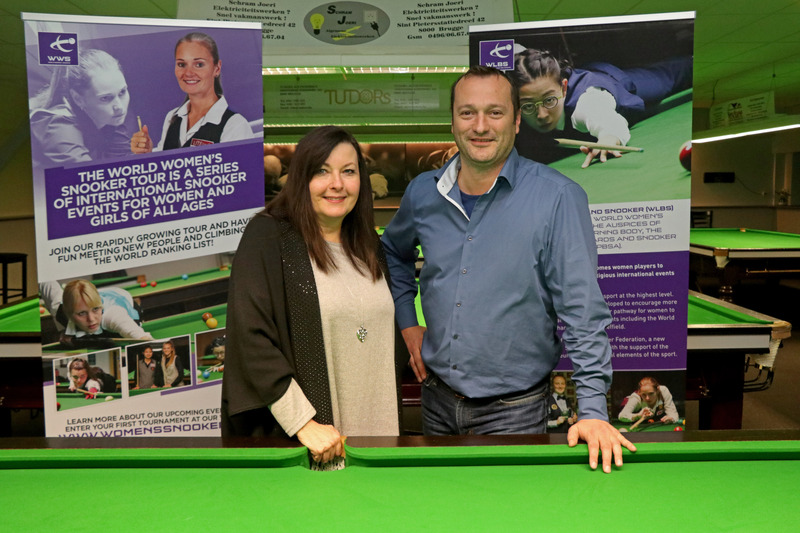 All at World Women’s Snooker would like to express thanks to our hosts at the Northern Snooker Centre who always look after us, as well as all of the players, supporters and officials who helped make the event a success once again. Full results from the singles competitions from the 2019 Festival are available HERE.